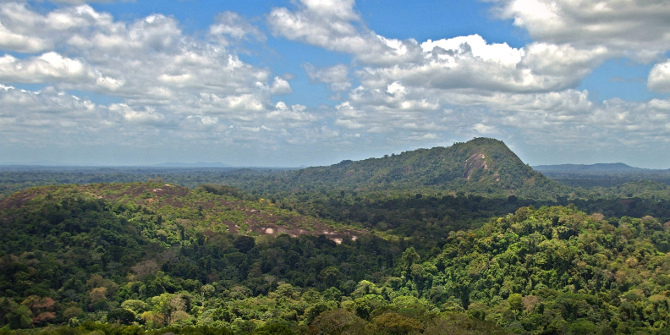 The Republic of Suriname, a former Dutch colony in northeastern South America, has the highest proportion of rainforest within its national territory, and the most forest per person, of any country in the world. In 2007, after a decade of legal struggle, Suriname’s Saamaka people – today some 115,000 descendants of self-liberated African slaves – won a signal victory before the Inter-American Court of Human Rights that guaranteed their territorial rights and offered hope of protecting the rainforest that was central to their way of life. The rebel ancestors of the Saamaka fought for nearly a century and finally signed a peace treaty with the Dutch colonisers that granted them their freedom and territory in 1762, a full century before general emancipation. By then they had already developed a vibrant and independent culture – their own language, religion, kinship, and legal system, and much else. Then, during the 1990s, they suddenly found their territory invaded by Chinese, Canadian, and other multinational logging and mining companies which were extracting resources with the explicit permission of the state. The constitution of Suriname, an independent republic since 1975, specifies that all non-titled land and resources belong to the state, rendering Maroon peoples such as the Saamaka and numerous indigenous peoples little more than guests on government lands. The constitution also denies the possibility that an indigenous or Maroon people could have a juridical personality and therefore collective rights to property (or to anything else). After Chinese loggers began to devastate their territory, Saamakas managed to organise their more than sixty villages strung out along the Suriname River for the coming legal battle. In 2000, they petitioned the Inter-American Commission for Human Rights, which ultimately found in their favour in 2007. This entry was posted on Thursday, August 2nd, 2018 at 00:05	and is filed under Uncategorized. You can follow any responses to this entry through the RSS 2.0 feed. Both comments and pings are currently closed.